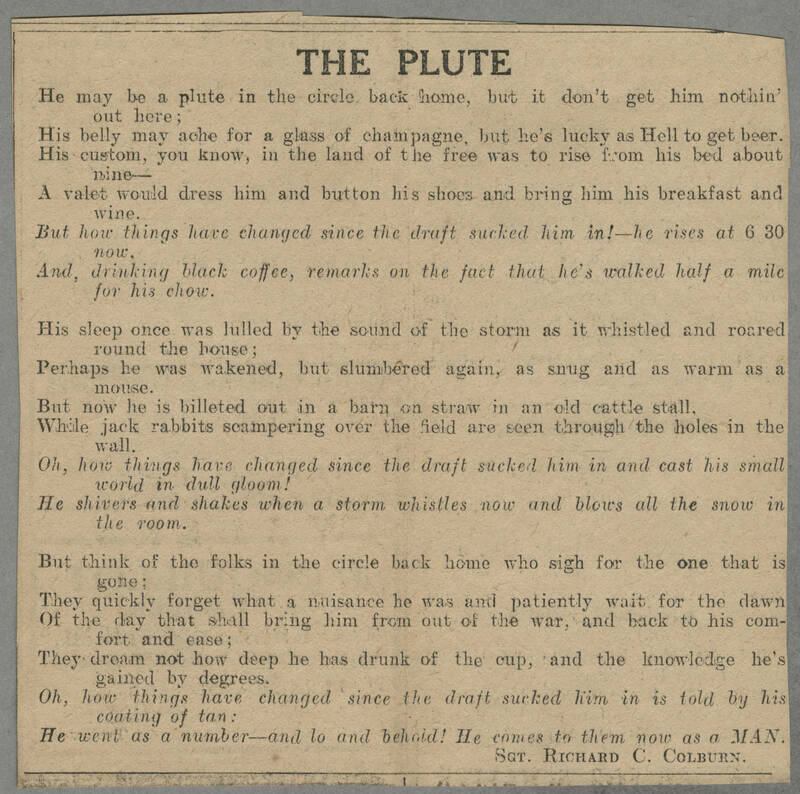 THE PLUTE He may be a plute in the circle, back home, but it don't get him nothin' out here; His belly may ache for a glass of champagne, but he's lucky as Hell to get beer. His custom, you know, in the land of the free was to rise from his bed about nine– A valet would dress him and button his shoes and bring him his breakfast and wine. But how things have changed since the draft sucked him in!–he rises at 6 30 now. And, drinking black coffee, remarks on the fact that he's walked half a mile for his chow. His sleep once was lulled by the sound of the storm as it whistled and roared round the house; Perhaps he was wakened, but slumbered again, as snug and as warm as a mouse. But now he is billeted out in a barn on straw in an old cattle stall. While jack rabbits scampering over the field are seen through the holes in the wall. Oh, how things have changed since the draft sucked him in and cast his small world in dull gloom! He shivers and shakes when a storm whistles now and blows all the snow in the room. But think of the folks in the circle back home who sigh for the one that is gone; They quickly forget what a nuisance he was and patiently wait for the dawn Of the day that shall bring him from out of the war, and back to his comfort and ease; They dream not how deep he has drunk of the cup, and the knowledge he's gained by degrees. Oh, how things have changed since the draft sucked him in is told by his coating of tan: He went as a number–and lo and behold! He comes to them now as a MAN. Sgt. Richard C. Colburn.